Hardly any other issue confuses people as much as finding the right jeans size when shopping for clothes. Don’t be baffled by American clothing sizes, European conventions and German standards. With our clothing size chart, finding your exact trouser size is perfectly easy. 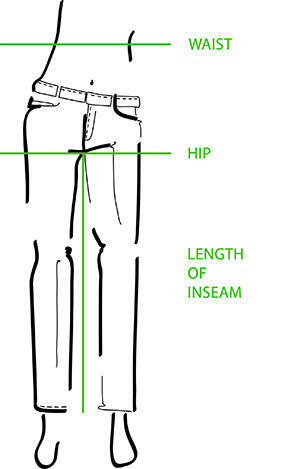 So, before you order your trousers, go fetch a tape measure to get the most out of the perfect fit of your MAC jeans. When choosing your size, please also take your wearing habits into account: if you like wearing jeans with cuffs, you should select one trouser size larger. Because of their comfortable stretchability, our Dream models made of stretch material should be ordered one size smaller. What a nice feeling when your new jeans fit like a second skin right away! This not only applies to stylish skinny jeans but is true for every single model. As a general rule, when buying MAC ladies’ jeans you can let German clothing sizes guide you, which indicate the respective width. Measure your waist circumference and compare the number with our size chart. You can now conveniently see your precise clothing size. In a second step, measure the inside leg length from the top of the leg to the floor. You may want another person to assist you. Alternatively, you can use a spirit level. Hold it horizontally at the crotch so you can make precise markings on the wall. Then measure the distance between the marking and the floor. Compare the measured length (in centimetres) and the figures in our chart (in inches) to find the right size of the jeans you want to buy. 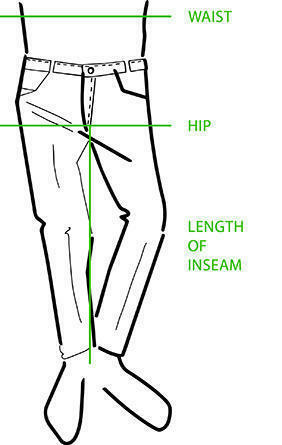 To choose the proper trouser size you should proceed as follows: first, use a tape measure to determine your waist at the narrowest part of the torso. Next, measure around the widest part of the hip. These two measurements now tell you the width you need on our size chart. Please note that in men’s jeans this is not the same as the customary German clothing size but is given in inches. Only the width in inches is important for ordering MAC men’s jeans. Now also measure your inside leg. This is easiest with the help of another person while standing upright with straight legs. An alternative method using a spirit level is described above in the section on ladies’ jeans. Find the length from the top of the legs to the floor in inches in our chart. It equals the trouser length that you need.